I wasn’t always Catholic. In fact, I was born into Quakerism, which I like to describe as being the exact-opposite of Catholicism, while still falling under the umbrella of the Christian faith. We did not have the sacraments (not even baptism and communion, which are standard among most Christian denominations). We did not have images (not even a cross on the wall). We did not have ordained clergy, but my dad was the “recorded” minister of our congregation. Looking back on it, it was a bit of an odd arrangement, but the gift of those several years as a Quaker was one thing: I learned how to be still and listen to the voice of God. This skill (if you can call it that) is one that came in handy in the years that followed. It enabled me to hear the Lord speak tenderly to my heart, to express his love and his call when I was a seventh grader. It drove me to love to study Sacred Scripture as a high schooler. And eventually, it led me to seek it out amid the cacophony of claims in Protestantism until at last I could hear his confirming voice and know that I was where he wanted me to be, in his Church. But I’m getting ahead of myself. In college, I faithfully attended church every week, whether or not I felt like I got anything out of it. 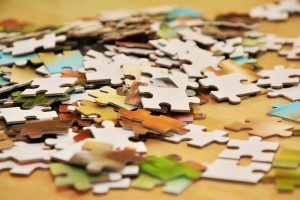 I began to have what I can only describe as a growing discontentment: I knew I loved Jesus with all my heart, but I wasn’t being fed by the churches I attended. I tried many, including in different denominations. 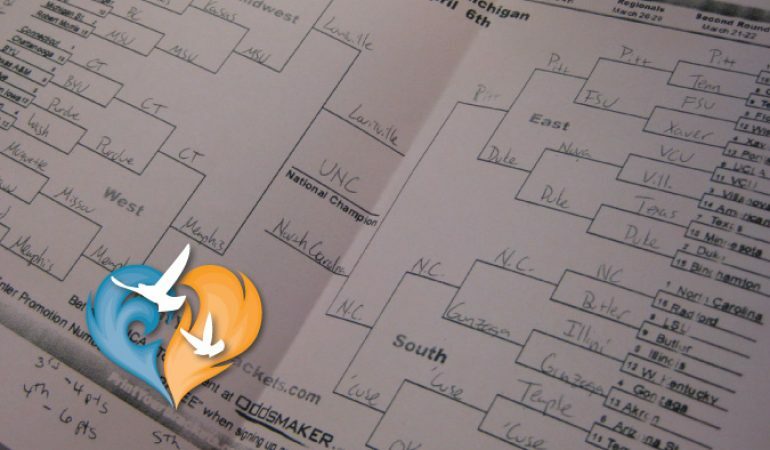 It was a bit like a religious March Madness — and perhaps a bracket system would’ve been helpful in narrowing down my search. Eventually I found myself somewhat placated in the Baptist church because I loved the fiery preaching and the emphasis on the written Word of God. Still, I was vexed by the way of salvation propagated by the church (put simply, “pray this prayer and you are saved,” and “once saved, always saved”). 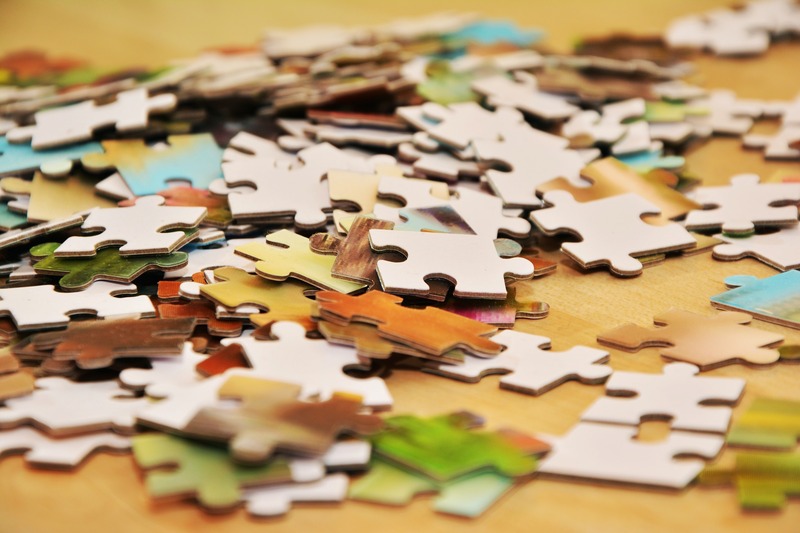 I wondered if there was something more, a piece of the puzzle I hadn’t found, and I was willing to keep searching. I knew that the Lord had spoken to me before, and I wouldn’t stop until he did it again. As the Lord would have it, I decided to study journalism and one summer I took a job at the newspaper in my hometown. The editor was a kind man who at the very least seemed to be amused by my interest in matters of faith. He generously allowed me to write a short series of columns about religion. I decided to tackle the question of why youth were leaving the church by the droves, only to come back later to raise their own children in the faith. In order to tie in a local connection, I set out to interview all the youth ministers in town. I met with leaders from every denomination, including Protestants, Episcopalians, and Roman Catholics. I was most struck by the latter two, but I had previously declared that “I would never be Catholic,” so after the columns were submitted I continued to learn more about Anglicanism. Initially I thought, This is it! At last I have found what I was looking for! I was dazzled by the beauty of the prayers, the angelic voices of the choir reverberating off the old stone walls, the incense swirling to the rafters, and the uniquely British pronunciation of words like “collects” (pronounced CALL-ects). I noticed things about the interior decor that were noteworthy: the altar stood at the center where the pulpit would’ve stood in the churches I had attended. The sermon wasn’t the apex of the service, and they had communion every week rather than “once a quarter” or less. In a word, things were ordered differently, and somehow, that felt right. The following year of college I considered myself “Baptist by day, Episcopalian by night”: I would attended a weekly service at the Baptist church and then on Sunday nights I would sneak off to pray compline with the Episcopalians at the church on campus. And every week, without fail, the choir would get to the Our Father and I would weep. After college I joined the Episcopal Service Corps, where God in his providence placed me in a church community of Anglo-Catholics (Episcopalians that practice a hybrid of Anglicanism and Catholicism). That year I was introduced to Catholic theology every week, including the two words that eventually changed my life: “Real Presence”. I remember the night well: I was singing in the choir for something called “Benediction” (I knew enough from my Protestant upbringing that this word meant “blessing”). I remember standing in the choir loft looking over the rail as Father Steve placed the monstrance on the altar. Later, I remember hearing bells ringing and watching as everyone knelt in their pews. I felt like I was right in the middle of an eighth grade writing prompt: the one where you are dropped on an alien planet and you have to make sense of the foreign activities you see and hear. As soon as I had the chance in the following days I pulled Father aside and asked him what it all meant. While I learned later that only a validly ordained priest can bring about Christ’s Real Presence, it was still a great gift that Father Steve introduced me to the teaching of the Catholic Church, which is that the Eucharist is Jesus: body, blood, soul, and divinity. And it altered something inside me to think that Jesus could be there in that form. 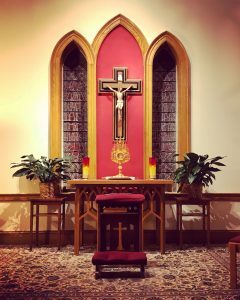 That night I began praying for faith to believe in his Real Presence in the Eucharist. Eighteen months later, by an act of God’s sheer goodness, my prayers would be answered. I had moved to Nashville to pursue a career in ministry in the Episcopal Church. Almost immediately I was introduced to a congregation of Catholic religious sisters who came to my workplace from time to time. Six months in, I was homesick, struggling in ministry, and in need of some time away with the Lord. When I looked up retreats in my area, the Sisters appeared in my internet search. The weekend of March 9, 2013, I went on retreat at their convent nearby and it was there, on that day, that Jesus revealed himself to me in Eucharistic Adoration. “I am he,” he repeated over and over again to my heart. I knew, without doubt, that it was actually Jesus before me. It was the Jesus I had known and loved my whole life: the one I had prayed to as a little girl, the one I had sung songs about in the back seat of my dad’s Volvo, the one whose voice I had sought through all my college years. At last he spoke, and his words were life and hope and peace. Like an apple tree among the trees of the woods, so is my lover among men. In his shadow I delight to sit, and his fruit is sweet to my taste (2:3). 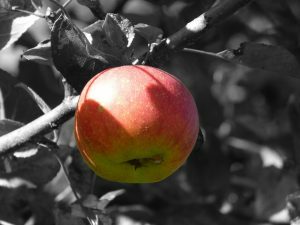 The speaker reflected that, though it is nothing impressive to look at, nor is it the grandest tree in the wood, the apple tree is the only tree among the trees of the forest that can feed you. This was my experience of discovering Catholicism: it gave me what I needed, what I didn’t even know I was looking for — it fed me. 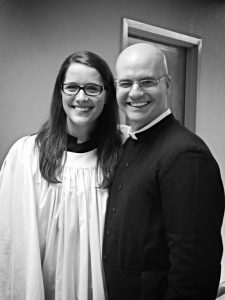 Like IBT blogger Caitlin Clendenin, Scott Hahn is a convert to Catholicism. Come hear his story at the Ignited By Truth Catholic Conference this coming April. Remember that God can use any circumstance, or person, to precipitate a conversion. Why not invite your non-Catholic friends to IBT, or purchase extra tickets for your fallen-away family members, so that they, too, can discover the Truth and Beauty of the Church?